Your Cover-Pools pool cover system is made especially for your pool. Consult with your Cover-Pools representative to help you choose the system to match your pool, design, and budget. Each custom cover system includes standard or optional components from the following list. The cover opens into a recessed housing, visually removing the cover roll-up from the pool area. The system is covered with a sturdy lid that provides easy access to all system components. An optional application is for the track to be incorporated flush into the concrete deck. Our high-performance fabric is offered in eleven standard colors. More colors are available in special-order vinyl. Please see actual fabric sample when making color choice. Colors may vary. 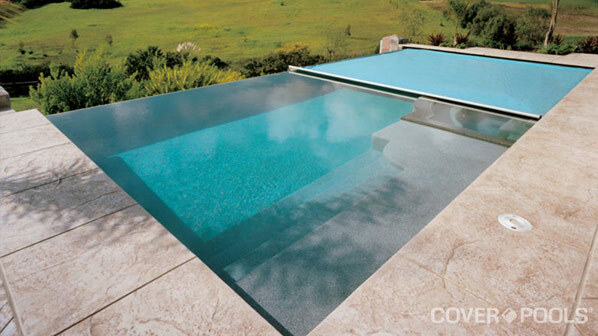 Cover-Pools offers many options to protect and hide the mechanism and keep your pool beautiful. The cover system from Cover-Pools is the most advanced cover system on the market today. It is available with the big RED™ electric motor or hydraulic power options. Cover-Pools revolutionary Corr-Resist technology is the best solution in the pool cover industry for fighting corrosion. Cover-Pools offers eleven standard fabric colors for your pool cover. You can also choose from an extended collection of special-order colors or create your own custom graphic. Cover-Pools offers many options for automating your pool features and cover. The Cover-Pools automatic cover offers the easiest way to keep your pool covered. Simply turn a key or press a button, and your pool is protected in under a minute. The powerful mechanism and motor contribute to the most advanced cover system on the market today and are available exclusively from Cover-Pools.